It was last light, and my front scout, Gair Anderson, my assistant team leader, Bruce Cain, and I were each placing a claymore mine facing an enemy trail. It was a well-used trail, four miles west-southwest of Quang Tri City, and we had heard enemy troops only the night before, casually talking as they walked along. We were confident that more enemy troops would return. Then, just as we slipped in the detonators, a dark figure suddenly appeared on another trail, a hundred feet away. It was Friday, July 19, 1968—my second patrol as team leader of a long-range reconnaissance patrol, and already my second enemy contact. In the first incident, eleven nights earlier, our five-man team had run head-on into an enemy patrol. Gair had quickly fired a long burst into the patrol’s lead, and we retreated into the jungle. But this time, we had only a small spit of ground and the Quang Tri River behind us, so we had to fight. As the three of us stood there, struggling to see in the fading light, the unknown figure, apparently unsure who we were, stopped, stepped back, and slightly raised his rifle. Gair was closest, and Bruce the farthest back, Gair glanced at Bruce and me, and seeing that everyone was still in position, he raised his rifle, aimed, and cracked off a shot, which sent the guy sprawling backward. But he was in an upright slouch, still facing us and looking alive enough that I raised my CAR-15, flicked the selector to auto, and emptied my twenty-round magazine in two long bursts of tracers that swept across his legs and chest. I was worried that the soldier could be the lead of a much larger force, so we threw grenades past him and I got on the radio with our tactical operations center to notify them of the contact. “That’s a negative. We’re a hundred meters south,” I replied, recognizing the calm, comforting voice of my former team leader and mentor, Sgt. Douglas Parkinson. He was serving his last weeks in TOC, providing vital expertise to the teams in the field before returning home. “Roger. We have a Papa Zulu [pickup zone (an area clear of trees, suitable for helicopter evacuation)] right in front of us,” I said, giving the handset back to my radioman. Time was critical for my team as we retreated into the remnants of vegetation at the Quang Tri River loop. What once had been beautiful countryside with scattered homes and rice paddies was now a wasteland of bomb and shell craters, with leafless palm trunks jutting up at odd angles. First, young Japanese men had come here to fight, then young Frenchmen, and now five young Americans who had just killed a young Vietnamese man. On enemy turf, with our backs against the river and under an overcast moonless sky, our only contact with the outside world was our twenty-three-pound PRC-25 radio. And I was in contact with the one man who best knew the terrain, my team, and me, for he had trained us all. He also knew that the enemy usually attacked at dusk, when they still had visibility to maneuver but we would have a tough time getting aircraft to respond timely and precisely, and an even tougher time directing artillery. A few minutes later, the helicopters arrived. 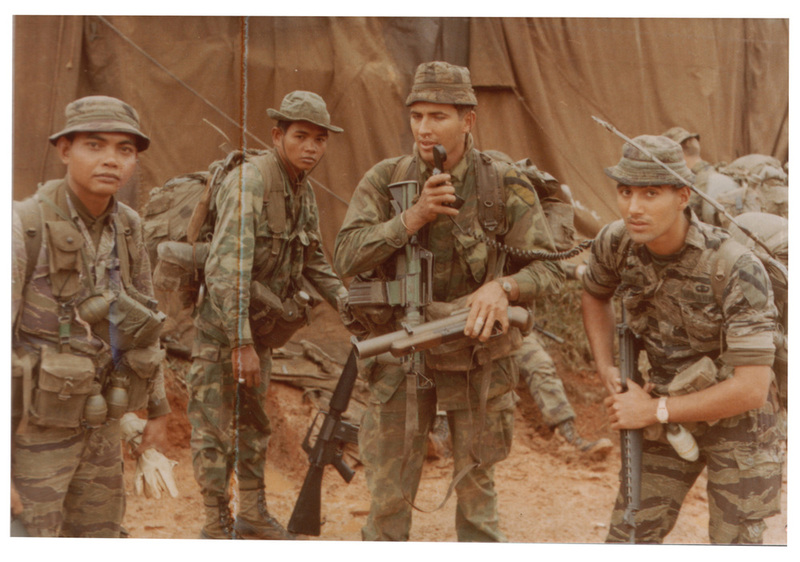 We directed their minigun and rocket fire, and seconds later the Huey descended between us and the enemy soldier, and we ran out of the tree line as long lines of bright-red tracers sailed from both gunships. Reaching the Huey, we jumped onto the skids and vaulted inside as the gunships quickly swung their fire around to our flanks, then underneath as we climbed. Minutes later, we were safely back at TOC with Doug. Doug Parkinson was a college grad from California with a degree in wildlife management, who had worked with the Alaska Department of Fish and Game before entering the Army. He was also a graduate of the U.S. Army’s Fifth Special Forces Recondo School, who guided his team like a loving father. Doug never yelled or got petty; he believed that real leaders made requests. Even in the most difficult circumstances, he could find a way to smile and laugh, yet he had the warrior’s ethos of taking the fight to the enemy, whatever the terrain. He was and is one of the finest men I’ve ever known. I first met Doug when I was assigned to his team as the radio-telephone operator at Landing Zone English, near the Vietnamese coastal village of Bong Son. It was Thursday, January 11, 1968, and the war was escalating fast, so our unit, the First Air Cavalry Division, was sent north to help the Marines. We arrived at Quang Tri City, near the DMZ, in mid-January, and our platoon and a few others built a rudimentary landing zone inside the remnants of a destroyed French camp from an earlier time. That was when the largest battle of this war, the Tet Offensive, swept across South Vietnam, killing 1,000 Americans, 14,000 civilians, and more than 32,000 enemy troops, 900 of them just outside our landing zone when they attacked Quang Tri City. After Tet, I went on my first patrol with Doug. There, in the triple-canopy mountain jungle and sparsely vegetated flatlands outside Quang Tri City, I learned his cautious and deliberate ways of patrolling. Though he was only 25, we respectfully referred to him as “the old man” because of his experience and our own youth. I was 19. On my fourth patrol with Doug, our team was inserted deep into enemy-held territory: Base Area 101—operations base for the North Vietnamese Army’s battle-tested Tenth Sapper Battalion and the 812th Infantry Regiment. The weather was gorgeous, and so was the terrain: 600-foot rolling forested hills and broad, sweeping grasslands. But the enemy heard our insertion and were trying to track us. We were hidden on top of a hill and watched them advance into the grassland, looking for us. As the team’s radioman, I listened while Doug calmly directed scout helicopters at enemy soldiers, killing the lead man of one group, who boldly wore a bright greenish-blue U.S. Air Force flight jacket and carried a shiny new AK-47. But the enemy kept returning, even after helicopter gunships attacked with rockets and machine guns, until they reached the foot of our hill and slowly encircled us. Doug directed a battery of 105mm howitzers against the advancing troops hidden in the woods below, but they never stopped. I could hear them below, and suddenly the reality of war was clear: they knew where we were, and it was their turn to kill. Doug fired his 40mm M79 grenade launcher into likely areas of their advance and directed us to throw grenades down the hill as our artillery continued to pound their positions on one side of the hill. And just when it seemed that we were done and Doug could do no more, one of the howitzers mistakenly dropped its rounds short, causing explosions on both sides of our hill. The enemy, perhaps stunned by the overwhelming explosions or perhaps uncertain of our exact position, stopped advancing. It was all the window that Alpha Troop, First Squadron, Ninth Cavalry, our division’s premier aerial reconnaissance and quick-reaction force, needed to come to our rescue. I made other patrols with Doug at Dong Tri, an eight-mile-wide 3,300-foot mountain that we climbed from bottom to top, each carrying ninety pounds of gear. This was outside the Marine combat base at Khe Sanh, during the North Vietnamese Army’s seventy-seven-day siege—the second-biggest battle of the war, and the most heavily bombed area on earth. I also served with Doug on Signal Hill, the remote 5,000-foot peak of Dong Re Lao in A Shau Valley, bordering Laos. There, our platoon performed a daring long-range penetration into the most formidable enemy sanctuary in South Vietnam (see: Battle of Signal Hill). From A Shau, I got sent to Recondo School and was made a team leader. And when I made enemy contact on my first patrols, Doug was at TOC to get us safely out. Doug returned home and married his college sweetheart, Gabrielle, and is now a senior biologist conducting environmental research in remote areas of the Pacific Northwest. He has a daughter, Tricia, and a son, Brandon. Doug stayed in contact all those years since the war, and he calls me every April 19, the anniversary of the First Cavalry Division’s assault into A Shau Valley.